Check out the above timed bombs planted at the entrance of a Winners Chapel church in Owerri Imo state last Saturday by suspected terrorists. Because of the security threat, the church service was relocated to another part of Owerri yesterday. 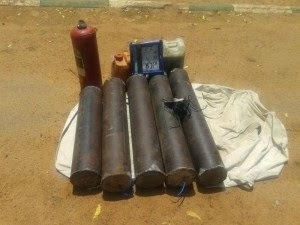 According to Owerri anti-bomb squad officials, the bomb was planted late Saturday night waiting for detonation during church service. Six suspected suicide bombers have been arrested in connection to the suicide bombing attempt. According to Police investigations, the suspects are all members of a Jihadi sect who came into Imo state to carry out the suicide bombing. Thank u Jesus for frustrating the device of the captive. I said it dat dis BEZO of a person must be a kid. Am happy to a announce to all NAIJAGISTS READER OR FOLLOWERS dat de name BEZO is a kid so mind how u comment on his trash. And he is also a boy. I guess this is a Church drama, too. Why blaming folks from annother state?. You better investigate church members very well cus as Nigerians usually say “no smoke without fire”. So unkown “terrorists” from another state come randomly and directly to that church and no member found them “planting” bomb at night when church should be closed(at least). And if church is closed at night that means bombs would have been placed outside the church. But it appears they were placed inside the church. If that is the case, who opened the door for them?. If they forced their way in, local community would have been alerted that night. There is no need to say jihadists from another state. Police and journalists need serious investigation into this rather than cheap shot. Remember Osun state church drama saga. That was swept under the carpet. And i told christians that if such thing happens again and it goes off, i will hold church members responsible. our God is not asleep God will surely fight for his children, suicide bombers or whatever they called themselves should go and hug transformer.